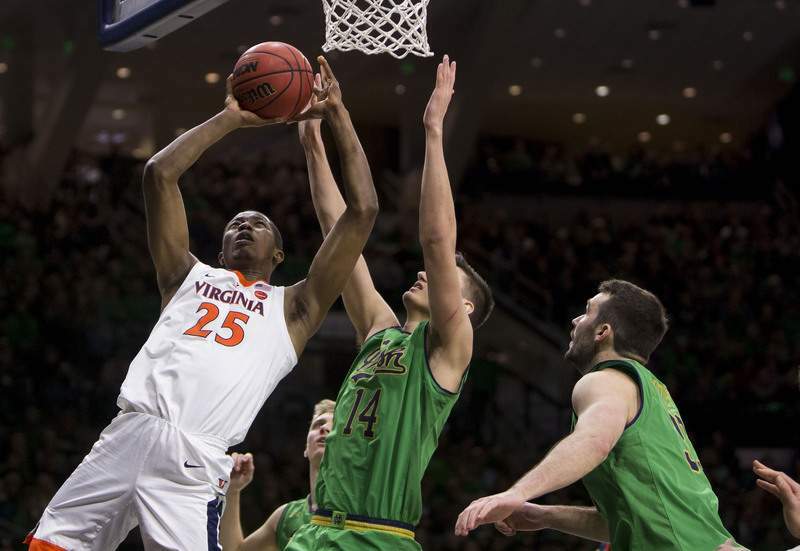 Associated Press Virginia's Mamadi Diakite goes to the basket Saturday against the defense of Notre Dame's Nate Laszewski, center, and John Mooney. SOUTH BEND – Some day the young players that dot Notre Dame's roster right now might mature into a group that can compete against a team as talented as Virginia. Saturday was not that day. The No. 3 Cavaliers jumped out to a 12-point lead before Notre Dame scored, and De'Andre Hunter had a game-high 19 points as Virginia cruised to a 82-55 win at Purcell Pavilion in front of an announced crowd of 9,149. John Mooney led Notre Dame with 15 points and 10 rebounds, his sixth straight double-double. It was the fourth straight loss for the Irish. Virginia (18-1, 6-1 Atlantic Coast Conference) didn't get to South Bend until 10:30 Friday night because of travel delays. Despite playing a game less than 15 hours after arrival, it was the Cavaliers who had energy from the outset. Notre Dame, suffocated by the Virginia defense, missed its first nine shots and didn't score until 6:25 had already elapsed. Mooney broke the spell with a jump hook for his team's first basket, but by then the Cavaliers had opened a double-digit lead. The Irish (11-9, 1-6) never got closer than eight points the rest of the afternoon. “That's men versus boys, flat out,” Notre Dame coach Mike Brey said. “(Virginia) kind of took our spirit. We couldn't get into any offensive rhythm, and I thought it really affected us defensively. It affected our fight, which was disappointing. The only real surge of momentum the Irish had was early in the second half. Mooney hit a pair of 3-pointers on back-to-back possessions, and D.J. Harvey added a deep 3 and a layup a minute later, cutting a 17-point deficit at halftime to just 12 at 54-42. It was the loudest the crowd got all day, and Virginia had to take a timeout. Off the stoppage, however, the Cavaliers found their footing. Hunter and guard Ty Jerome scored twice each during an 8-0 run that pushed the lead to 20, and the outcome was never in doubt again. At the same time, Brey acknowledged that stopping the Cavaliers from getting to the hoop is a tall task for his depleted team. As Virginia built its lead in the first half, much of the damage was done by guard Kyle Guy. Guy, an Indianapolis native and the 2016 Indiana Mr. Basketball, scored all 15 of his points in the first half and went 6 for 8 from the field.